The formerly known PFlow Toolbox#3 is now integrated into 3dsmax 2014 and called “Advanced Data Manipulation”. 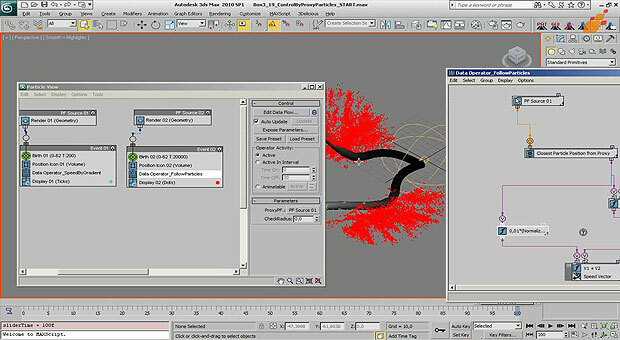 This tutorial shows how to use a particle system to control another particle system. This is a neat way to control bird flocking for example by just using very few particles. This can be used for some sophisticated nanomite type setups. The initial motion basics are taken from the SpeedByGradient tutorial from the “Gradient KungFu” set. The video is 9 minutes long in 1280×720 WMV format and the download features the start and final setups, as well as screen shots.